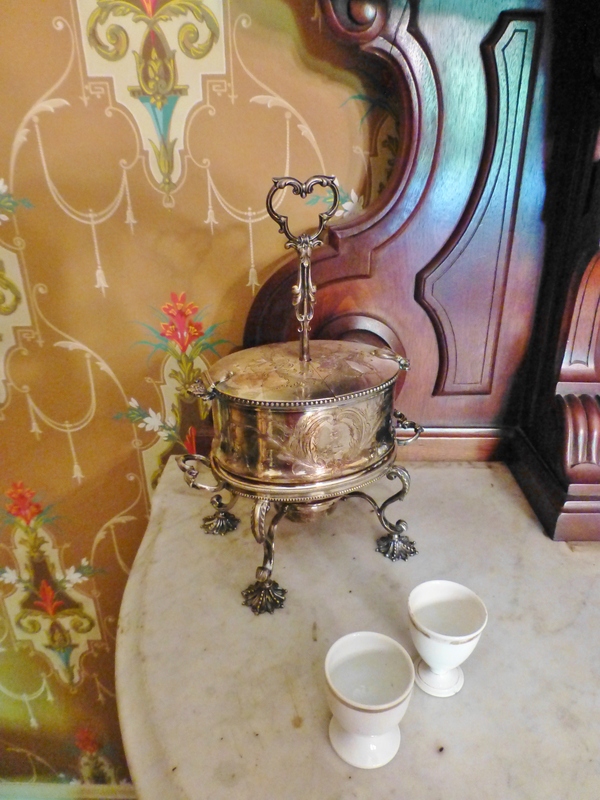 The Ebenezer Maxwell mansion had all the latest gadgets, including a call-system for the servants. According to an 1860 census, the Maxwell family had three live-in female domestic servants. I’d be happy with just one! 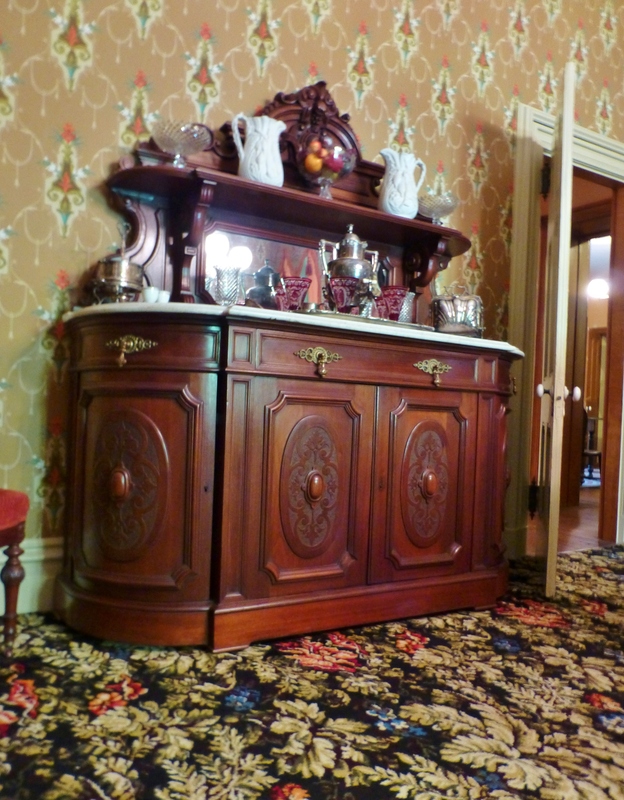 Welcome back to the second part of my post on the Victorian Interiors at the Ebenezer Maxwell Mansion in Philadelphia, PA. I’m very excited to share more from my exclusive photo shoot of this suburban 19th century home, the only authentically restored Victorian Era house museum in the Philadelphia area. 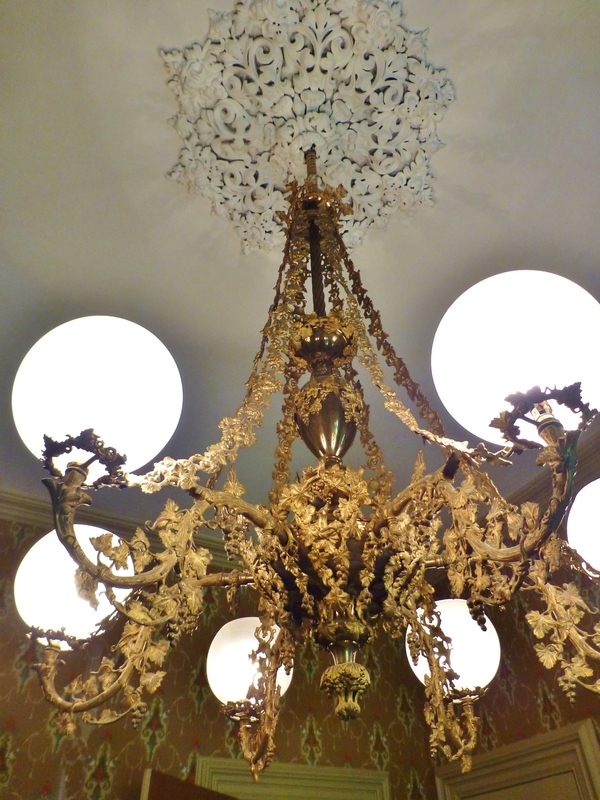 Normally interior photography is not permitted, so I’m truly honored to be blogging about this phenomenal Victorian treasure! Last time I focused my post on the entry and the formal parlor. Today, I want to share with you the understated study and the colorful formal dining room. But first, let me just finish up by showing you the back of the entry hall on our way into the Study. All the way at the back of the foyer sits this lovely chair with an ornately pierced floral back. Notice the black horsehair upholstery, typical of chairs in this period. 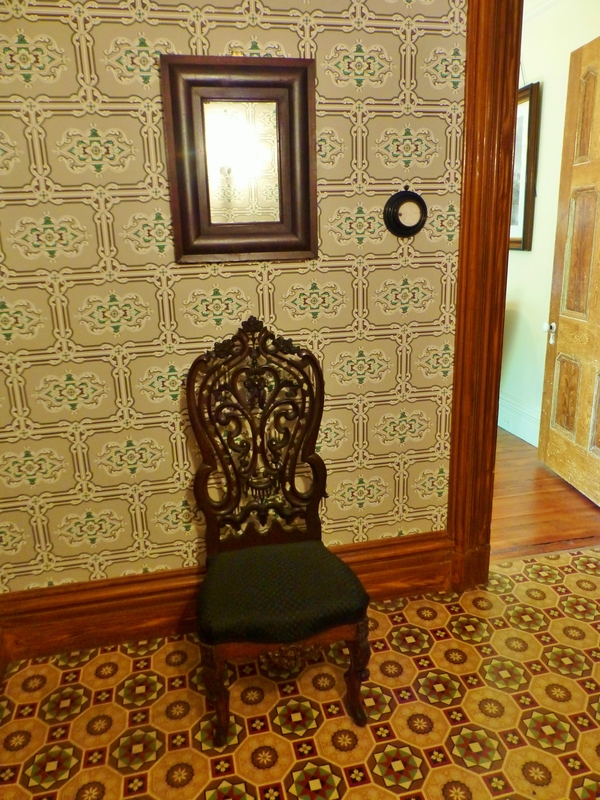 Above the chair is an antique mirror and to the right, you will see a round circle on the wall. Let’s look at that in more detail. Ta daa!! It’s a Hygrometer. This handy device is used to measure the moisture in the air. I can only assume it was needed because of the original central heating. This was certainly very high-tech for the time! Immediately to the right of the hygrometer, is the entrance to the Study. Let’s go in there next. 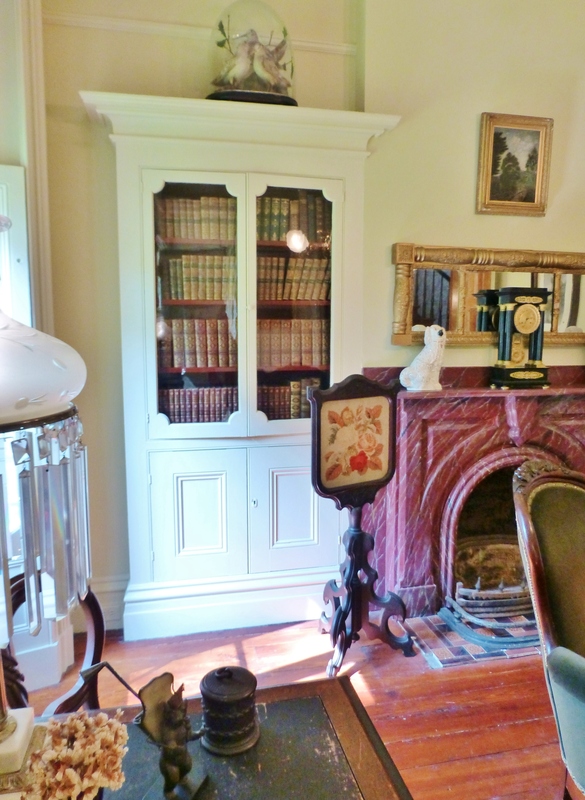 The study features a marbellized slate fireplace mantel flanked with built in bookcases. A stately center table would be used for reading and studying maps or folios. Did you notice the ornate air vent at the top of the image? That’s evidence of the mansion’s original central heating system. I’m also sure you noticed the lack of wallpaper and patterned area rugs in this space. That style was reserved for the more ‘public’ rooms of the home. I find this simple, straightforward style so appealing and peaceful, don’t you? Here’s a closeup of the fireplace and bookcase. Notice the pretty fire-screen to the left of the mantel. The needlepoint might have been hand worked by the lady of the house, since this was an acceptable pass-time. And did you see the glass cloche atop the bookcase? It houses more bird taxidermy–these are American Woodcocks. The opposite side of the room is very simple. 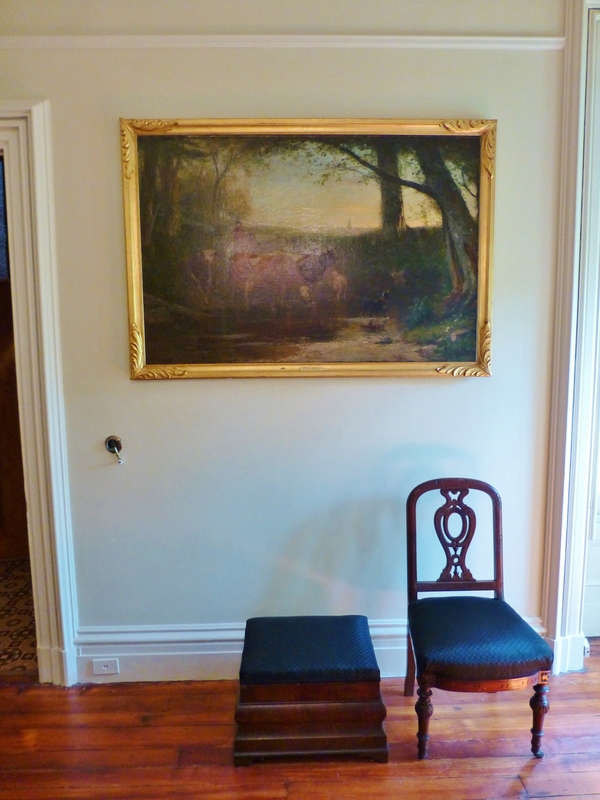 A large landscape oil painting and a chunky Empire style ottoman and side chair. 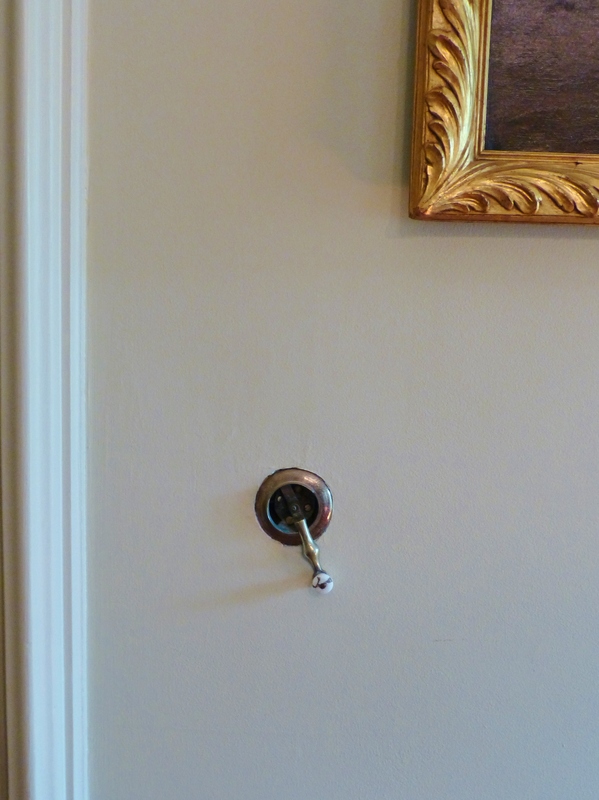 My eye is drawn to the crank in the wall…do you see it there on the left? It’s for calling the maids! 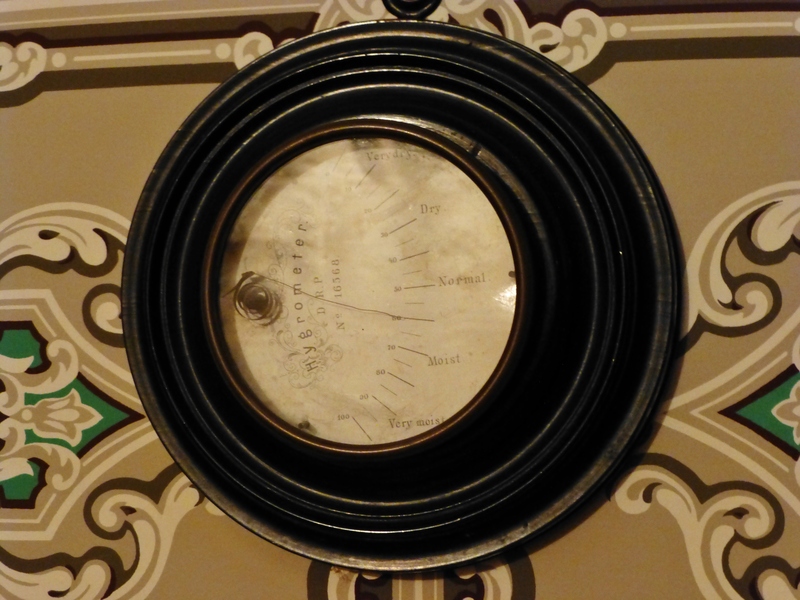 The Ebenezer Maxwell mansion had all the latest gadgets, including this call-system for the servants. According to an 1860 census, the Maxwell family had three live-in female domestic servants. I’d be happy with just one! 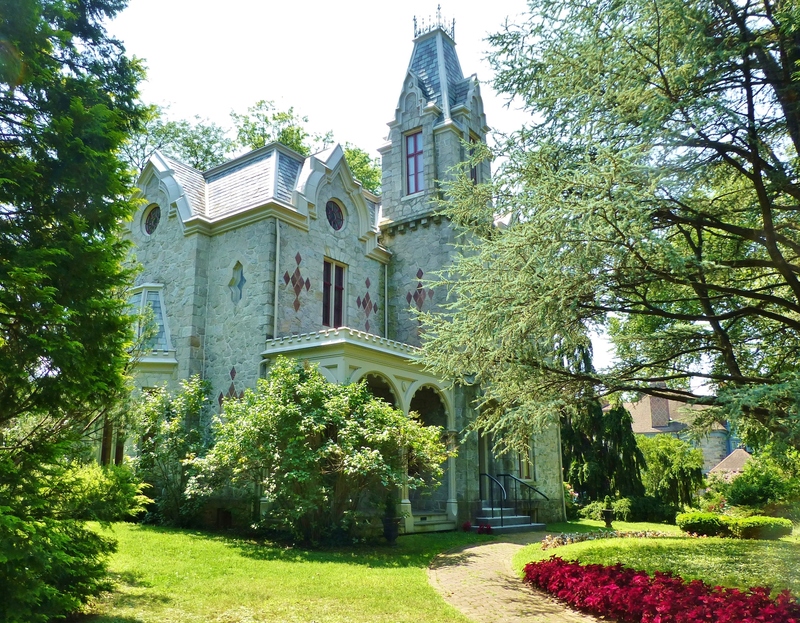 The Ebenezer Maxwell Mansion hosts an ‘Upstairs Downstairs’ event every month. 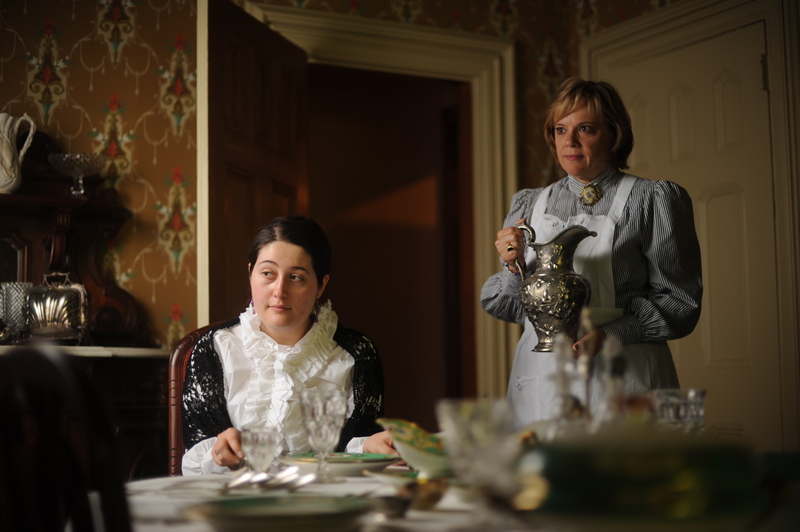 This is a special guided tour featuring actresses, portraying a Victorian maid (downstairs) and the lady of the house (upstairs), who guide you through a house tour, providing a unique perspective into the Victorian lifestyle. 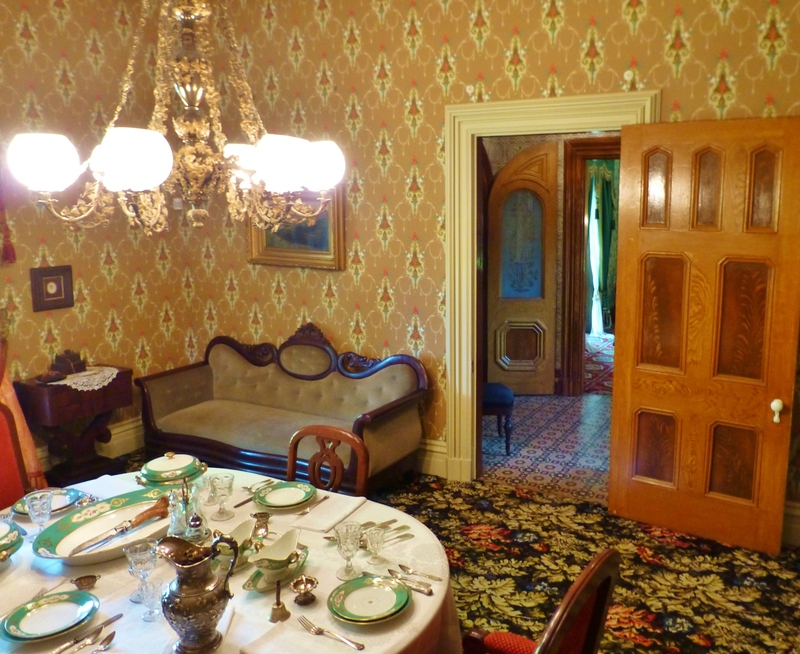 Now let’s visit the dining room, which is at the front of the house, directly across the foyer from the parlor. 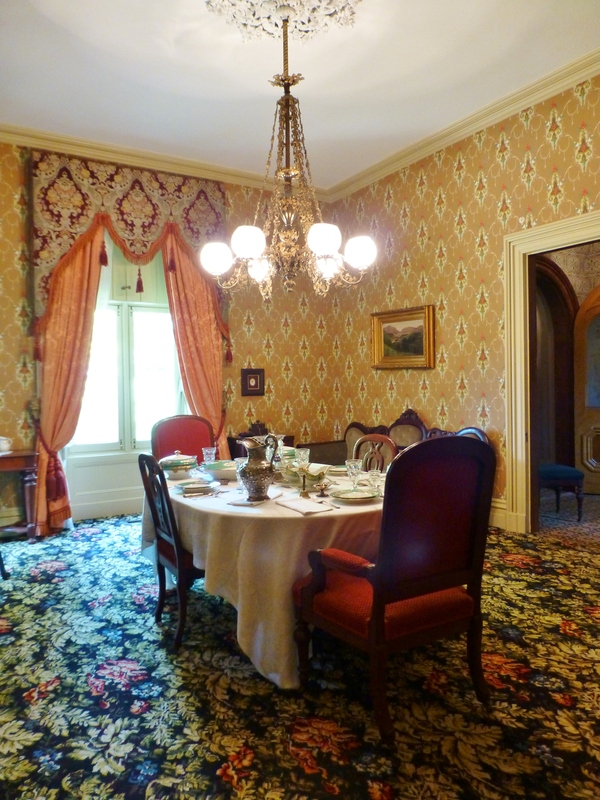 The dining room features a Scalamandre wallpaper, authentic to the period. The table is set with a fine tablecloth and formal place settings. I’m sure you know the Victorians dearly loved their silver and china. Me too! 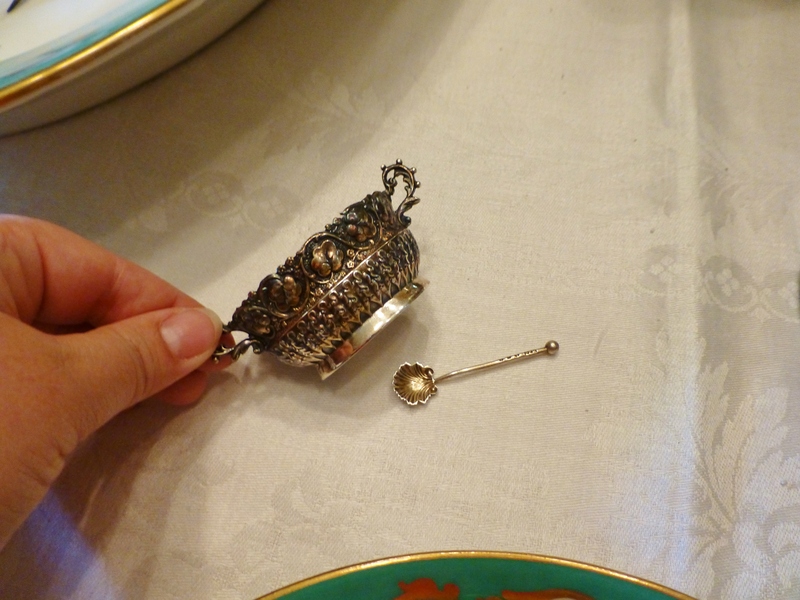 Here’s an example of a Victorian silver salt cellar and its miniature spoon. These are a fun alternative to the typical salt shakers we use today, don’t you think? And that super fancy, teeny tiny spoon–LOVE! 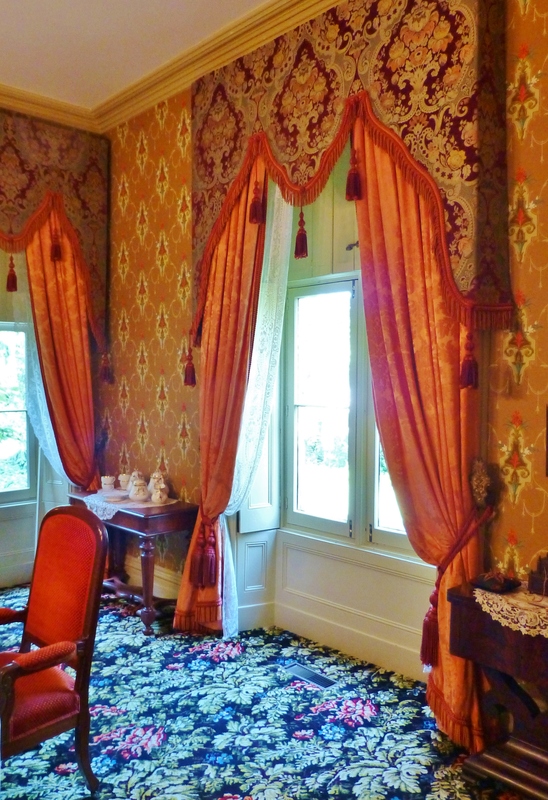 The dining room windows feature silk draperies with ornate damask lambrequins. A lambrequin is an upholstered cornice board which extends farther down the side of the window. These lambrequins are enormous! Can you see how big they are compared with the dining chair? The Renaissance Revival buffet in the dining room is a stunning example of high Victorian furniture, and is one of the museums most prized possessions. 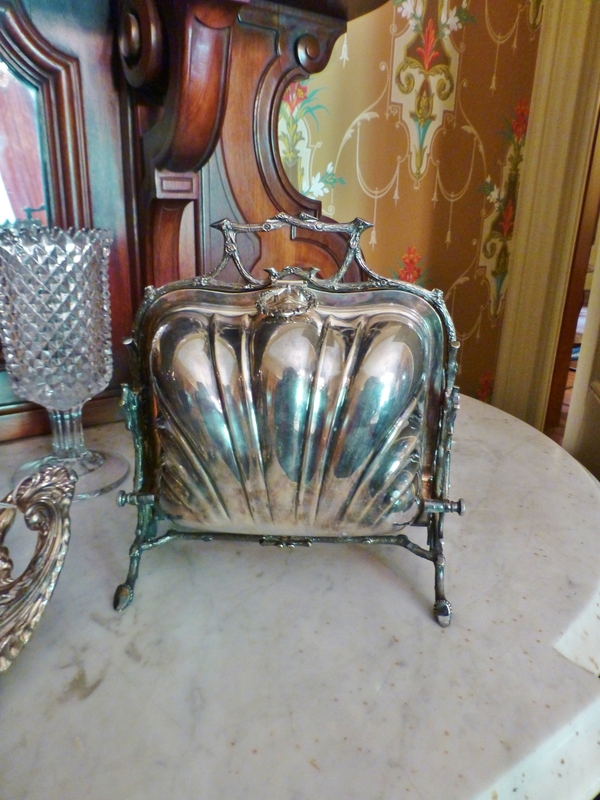 This silver egg warmer is one of my favorite things in the dining room. I just love different and unusual Victorian serving pieces. Those Victorians were so clever about this sort of thing! Hard boiled eggs rested on the rack and were lowered into hot water to keep them warm. Pulling on the handle, would raise the rack and allow the eggs to be served at the proper temperature. So cool! 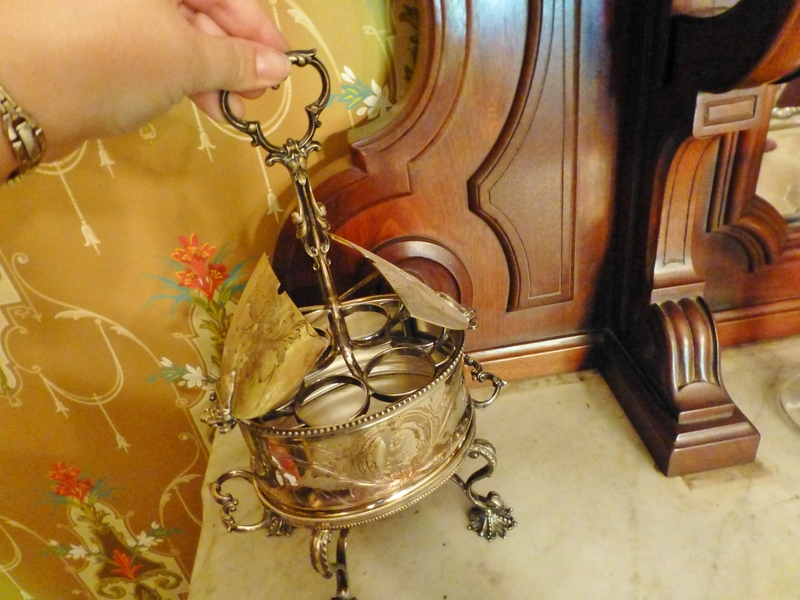 Another fascinating serving piece is this bun warmer, which kept bread and rolls warm during meals. Behind the bun warmer is a handsome Celery Vase, used to keep celery fresh (celery was highly prized and it was believed that celery aided in rheumatism). Many people have glass vases like this one and don’t realize how they were used over 100 years ago. Celery Vases were very popular Victorian dining room accessories. 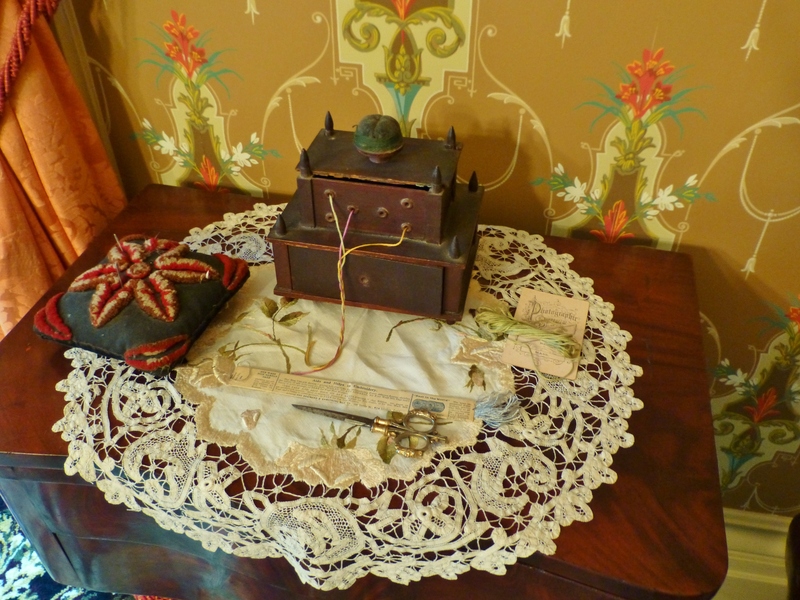 The dining room also features a sewing corner, with various implements that might be used by the lady of the house. I’m very fond of the thread holder in this image, which kept all the different colors of embroidery floss from getting tangled up. 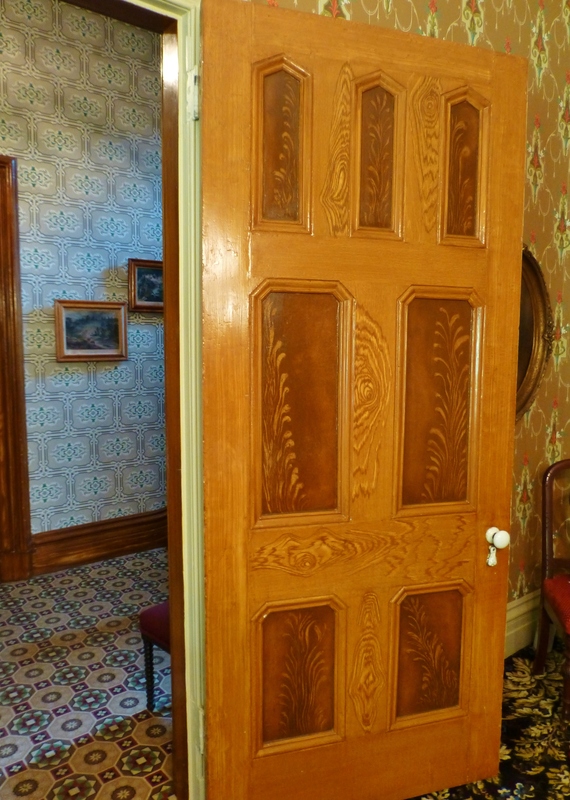 Much of the woodwork in the house, including the doors in the dining room are hand-painted faux wood grain. If you look closely you can see that various colors of brown, caramel and gold paint have been used to simulate more expensive wood grain patterns. This was a popular thing to do in middle class homes of the Victorian era. Doesn’t it look so real? 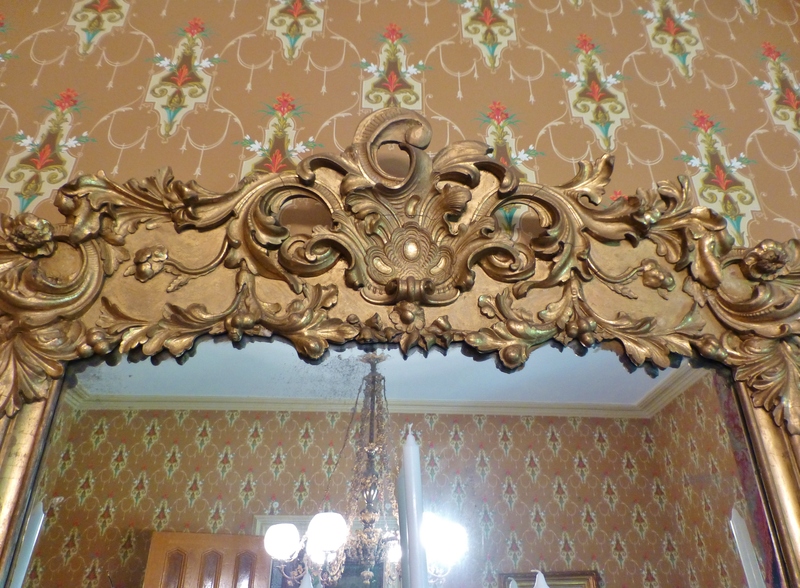 The dining room features another dazzling gilt mirror above the fireplace mantel. This image also highlights the colorful wallpaper (I love the salmon, caramel, and turquoise color combination in the room), and of course, reflected in the mirror is the splendid dining room chandelier! The lavish dining room chandelier is dripping with grapes and grapevines. Each arm is a faux-bois marvel, emulating wood with grapevines twirling around their length. A final view of the dining room with its table set for a sumptuous Victorian dinner. 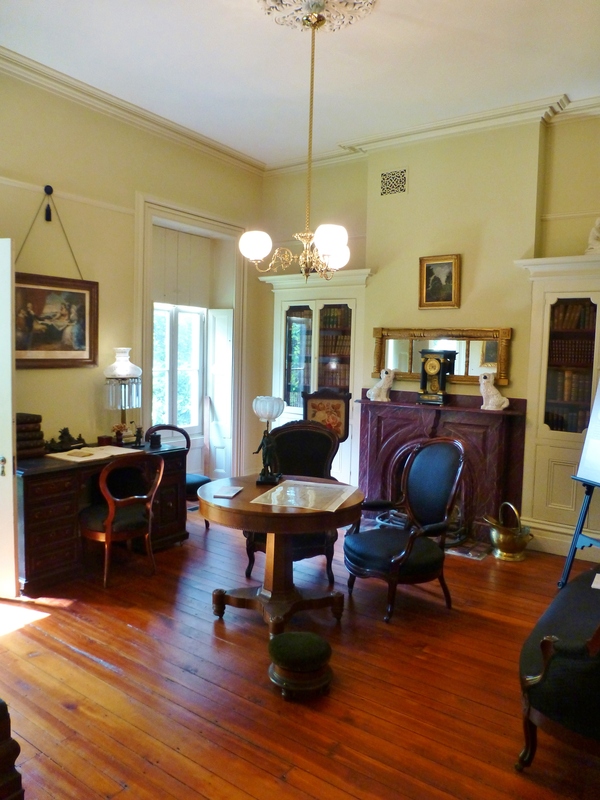 I hope you enjoyed my tour of the study and the dining room at the Ebenezer Maxwell Mansion. This place is definitely worth a visit!! There’s just so much more to see. Until next time, when I’ll take you upstairs to share even more of my exclusive feature on the interiors of Ebenezer Maxwell Mansion, please post your comments telling me what you think about these historic rooms. Isn’t it fascinating to see how people (just like us) lived back in the 1800’s? I always love to hear from you, and I’m even more happy if you share my blog and tell your friends about me…I need all the friends I can get! This entry was posted in Antiques, Historic Sites, Home Decor, Mansion, Victorian and tagged Chandelier, Dining, Draperies, Ebenezer Maxwell, Furniture, Hygrometer, Interior Decorating, Museum, Robinson interiors, Servants, Study, Wallpaper. Bookmark the permalink.